The last exercise in the workout has this button instead of a > arrow. Tap it to open the workout completion page. You can also tap and select Finish Workout. Tap Insert Exercise to add one more exercise to your ongoing workout. GymGoal stops the workout duration timer once you open this page. Tap START if you have not finished your workout yet. Check the start time and duration – this is important. 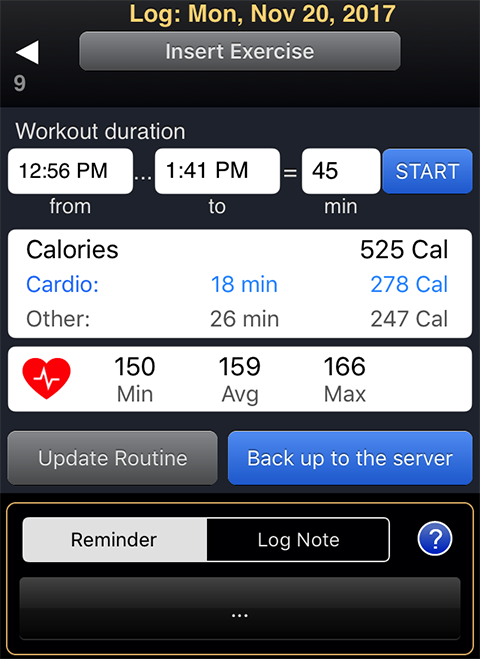 The workout duration is used to calculate calories. Correct start time and duration are required for correct heart rate and location data. Calories are broken into two parts – cardio calories and calories for other exercises (weights, stretching, plyometrics). Tap the calories area to enter the calories manually or to adjust the calculation of non-cardio calories. Only cardio exercises have heart rate entry fields, but you can track your heart rate during the whole workout. The numbers in the heart rate area on the workout completion page are for the whole workout. Taping in this area opens the heart rate graph. Update routine updates the routine this workout was based on. This action is available only when a workout was based on a routine. GymGoal finds the differences between the routine and the recorded workout and applies the changes to the routine. You can select what changes to apply, what to skip. Please review carefully all changes before committing them. Back up to the server to save your GymGoal data. If something happens to your iPhone, or you need to reinstall GymGoal, you will be able to restore your data from this backup (Tools > Download). Reminder and Log Note – same as on the first workout logging page. They are attached to the whole workout, not to a specific exercise. You can enter notes about the specific exercise when you are logging this exercise.